Ben Towery winning the Masters B category. Photo: Natalie Steed. The 2011 edition of the Harvest Moon Criterium saw great weather, big prizes, exciting racing and the biggest turnout in 3 years. The day started early in the crisp hours of the morning with the largest junior field we’ve seen in a long time. 12 juniors made it look easy with many of them taking part in the adult categories later in the day. One of those was 12-year-old rider Katie Clouse. She won her age group then went on to finish in the Women’s Cat 4 race which was won by Megan Burger. 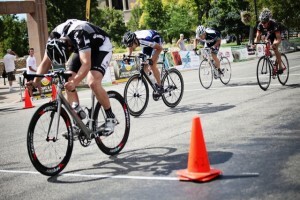 Competitive racing was seen all across the spectrum of categories on the tight, 4 corner crit. Only one crash occurred during the day. On the last lap of the Men’s Cat 4 race, 6 riders were taken out in turn 2. While there was some road rash, the worst damage was contained to mostly equipment as Ryan Pace saw his bike break in 4 places! His consolation was winning the big prime of the day, a flat screen TV from Sun Valley Mortgage. Mike Underhill stayed clear of the carnage and followed up his Sanpete Classic win with a big sprint to take first. With $2000 in prize money at stake, the Women Pro/Cat 1/2/3 race was set to be a great race. This was the largest cash purse the women have seen at a UCA race in a good while and the ladies present were well aware of the cash waiting for the winners. With LOTOJA winner Keri Gibson, Simply Mac Crit Series winner Kaytie Scott, Primal Utah standout Chantel Olsen and pro rider Nicole Evens, there was plenty of talent on display. 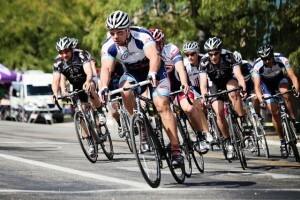 The group stayed tight with a series of attacks during prime laps. Each lady seemed to be waiting for Nicole Evans to make a move. With 5 laps to go, Evans indeed put the hammer down and won the race by 38 seconds. She claimed the $600 winners loot in the process. The rest of the field finished in a fast and close sprint with Laura Howat and Kaytie Scott rounding out the cash heavy podium. The largest field of the day was the 29 strong Men Pro/Cat 1/2. This group had hundreds of dollars in primes and prizes on the line and the race was fast from lap one. The two $100 primes came back to back with Chase Pinkham taking the first prime and TJ Eisenhart pipping Pinkham for the second $100 prime by just centimeters. The battle for elite category supremacy continued for the duration of the 60 minute race with Michael Wilcox finally taking the win. Todd Hageman and O-town local Bryce Young took the next two spots in what capped off an excellent day of racing.